Salam! My name is Luther and I'm currently serving as a Peace Corps Volunteer in the Kyrgyz Republic. Enjoy the stories, and I hope you learn something too. My usual technique is reading while making grunting noises, lifting and forcing the facts into my brain, bench-pressing each line until little beads of sweat form at my temples. The answer is found in what’s called spaced repetition. It’s as obscure as it is life-changingly useful; I don’t know why it’s not part of mainstream education yet. Here I’ll go over the theory briefly and then propose my own simple reading technique based on this principle. I also suggest a couple of software programs you can use to help you remember just about anything. 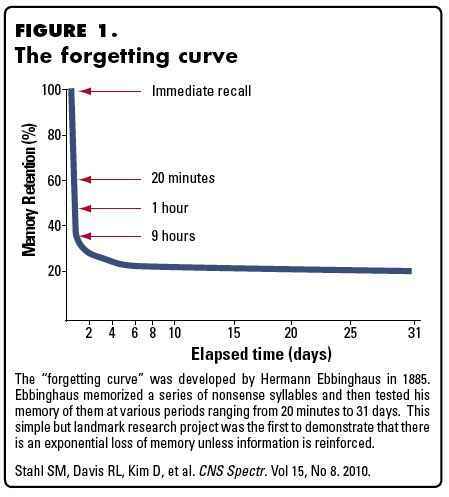 This forgetting curve graph shows us five curves. Each curve represents an engagement with a specific set of material, say a vocabulary word. After the first time you see a new vocabulary word (the first engagement), your brain “forgets” the word quickly. Thus, a steeper curve. Forgetting means not being able to recall the word without being prompted. The point at which you “forget” is marked with the horizontal grey line. The next time you see the word and its meaning (the second engagement) it takes your brain longer to forget the word. The third time, even longer. Therefore, the material stays above your recall threshold longer. Researchers are still trying to discover just how long our recall ability lasts between engagements. Engage too quickly and your brain never lets you jump from curve one to curve two, counting shortly spaced reviews as only one engagement. Too much time in between engagements and the material has completely slipped below your recall ability and you again get stuck on the same curve. Several memory software companies claim to have found the perfect algorithm. Then there’re slightly more mainstreamed companies like Anki. Built as a user-input flashcard program, Anki works off of a similar algorithm to SuperMemo. Each time a flashcard pops up, users rate the card based on how well they remembered it. This allows Anki to determine the length of time until it shows that flashcard again. While my method below has not been developed through decades of algorithm research, I believe it does a fairly good job at approximating the increasing periods of time necessary for spaced repetition. Plus it’s simple, user friendly and doesn’t require you to take a scissors to your biology text book. Flip through the entire length of what you are about to read. It could be one chapter, a research paper or even a whole book. Make mental note of chapter titles, topic sentences and summaries. Put the book down and do something else. Make this time no less than five minutes but no more than thirty. Now read the first two sections. Depending on your reading material this could be the first two chapters or it could be the first two headers or whatever. Put the book down. Now try to recall the first section. Use the 5Ws to get you started. Who were the characters, the players, the authors? What happened? Where is it set? When did it all occur? Why is it important? Pick the book back up and read through section three. Stop and try to recall the second section keeping with the 5Ws. Proceed until the end of your reading for the day. When you finish, give yourself a short break (as long as it takes to read one section) before recalling the last section. Again, take another break. Answer e-mails. Have lunch. Stop thinking about what you read for awhile. This break should be longer, at least a couple of hours but not longer than one day. Next, write a simple outline of what you just read. You can choose how much time you want to put into this from just a few bullet points to listing major and minor characters, subplots, writing out theorems, etc. Immediately compare your outline to what you read, skimming back through the text and adding to and correcting your outline. Take another break but this time wait at least 24 hours before going back and reviewing your notes. It’s important to note that when you return to the material in future engagements, you shouldn’t simply read over the information again. You need to quiz yourself on the content. (Like answering the 5Ws.) Just like with a vocabulary word flashcard where you make yourself recall the definition, you should be doing the same type of thing with your math theorems, comparative politics, etc. You may need to adjust the times somewhat for your own biology. In general, if you find yourself not remembering things when you go back a second or third time, you need to shorten the time in between your engagements. If recalling the information is really easy on your second or third time, you can wait longer until you engage the material again. And seriously–check out some software for memorizing stuff, like mnemosyne. It might just change your life. Good luck out there on the memory slopes—have fun and hang 10! http://www.gwern.net/Spaced%20repetition – A comprehensive look at spaced repetition. Gwern is probably one of the neatest things on the internet you’ve never read. Get lost in this site for a few years. https://www.examtime.com/blog/study-hacks/ – Tried and true suggestions like drinking water and getting enough sleep. Also useful. And necessary. There’s this really weird thing that happens in Kyrgyz schools. You’re teaching a class when all of a sudden the door opens, some random face peers in, the jaw goes slack, and the door closes. Then it happens again. And again. Count ‘em, six, seven, eight times or more the door opens and bangs shut, eight times or more the flow of the lesson stops, the waves crashing against the blackboard. Not a single face asks for anything. Not even a foot steps in the room. There’s no answer. No reason. No explanation. I caught one of the people once as they were turning down the hallway, running after them to catch up. Once I tried locking the door from the inside to keep people from opening it. The next person just knocked until I opened it. Yes, I’m teaching in here! What else goes on in a classroom!! It must be the universe just having a laugh at this lesson. And I mean the lesson I’m being taught as I stand in front of the room. Life is just one long list of interruptions. Whoever called life a path was wrong. Life is not a path. It’s a game of plinko. Actually, it’s not ironic at all because interruptions are all that ever happen. There’s no such thing as a line we tread through life. We’re jostled. Bumped. Tossed. Lifted and hurled. One of you out there tell me you’re in the spot you pictured being in 10 years ago. My friend Maksat likes to say one little turn even from your current direction puts you in an unimaginably different place years down the road. One degree to the left or the right. One nudge. One phone call possibly. And it’s so good to realize that. To know that the interruptions aren’t hurting your plans for your life. They are your life. That when the phone rings you’ve got life coming at you in a way you maybe couldn’t have anticipated and it’s your new little thread that you grab onto to ski along the waves. Life is interruptions, and that is great. What are your favorite interruptions? Where have they taken you? Hey all! 2015 has been rung in and I’m back in Kyrgyzstan for my last stretch in the Peace Corps. Six months left today until I COS (that fun acronym for closing my service!). 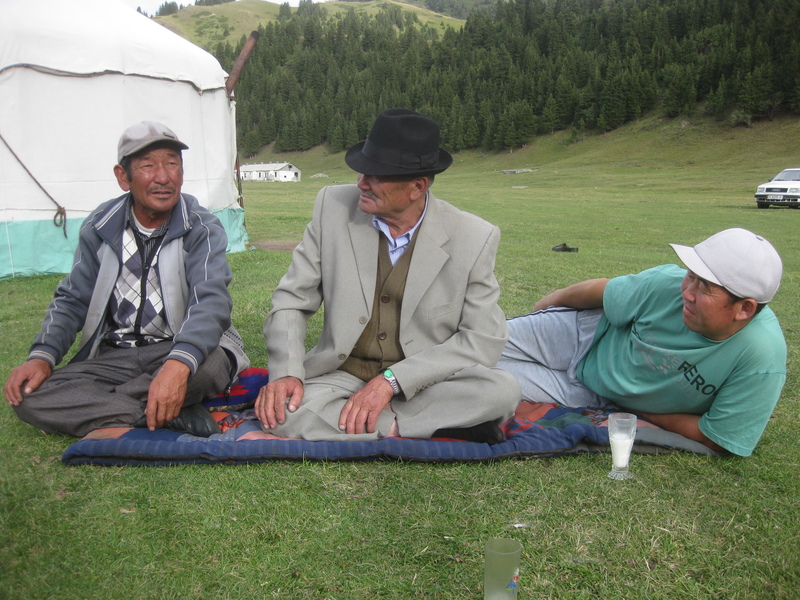 “Makal” in the Kyrgyz language means “proverb.” Kyrgyz is full of wonderful and puzzling little proverbs – some that match common proverbs often heard in English and some that are real head scratchers. Most Mondays I’ll post one of the more fun ones for you. Let’s see if we can’t make some of these commonplace in America by the time I get back! Thin tendrils of ice fractured the surface of the puddles in the street. My breath broke the morning air as I clomped along in faux-fur lined boots to the bank. “How much would you like to take out?” she yelled through the glass. “63,000.” (About $1,300, or the price of a small horse.) I answered back, trying not to sound too conspicuous. I punctured the glass with my words. The two other people in the room had stopped moving and were now staring. She slid a scrap of a post-it note and a pen under the window. I wrote it small and passed it back. She punched it in, and the money was there. Her coworker came out of the vault with the top of an old cardboard box filled with cash. She began counting it out. “No, where are you from, from?” The daily question came early today. She asked me to scratch my name down for her and passed me back the same slip of paper with my pin code on it. I ripped it off, wrote down my name and passed it back. “Goodbye, Goodluck,” I said, a hand in the air and 63,000 som in my pocket. “And hope you can hang onto some,” I thought. It seemed like the bank needed it. It’s a simple idea put forth by many evangelicals throughout history: the idea that, prayer is a time where we meet God, where we commune with him as close friends, and that it doesn’t happen unless we spend significant, quality time with him. The illustration is simple as well: those who are your acquaintances and those who are dear friends are separated by hours and years worth of time together, shoulder to shoulder and face to face, sharing life. There’s such a big difference between knowing something and doing it. Looking back I wonder how I could have been stuck so long thinking of God like the giant piñata and prayer as the stick that brought blessings raining down like tootsie rolls and gobstoppers. I had a list even. A sheet of folded paper with sections for each area of my life. It’s not wrong to organize your prayer life. Keeping cards can be helpful in reminding you what to pray about. But the end goal isn’t the list. The point isn’t to check off items on a prayer sheet. The end goal is communion with the creator. How many times I’ve hurried through the list without ever getting to pray! Passing up the opportunity to connect with the creator is inconceivable when you stop to think about the magnitude of his glory and how he’s stooped to make time and make possible the chance to be with you, sitting there in your room next to you, a hand under his chin, just waiting—waiting for you to slow down, to focus your attention, to pray into that moment when you begin to pray. It’s incredible how much time has passed here living in this foreign land for me to get this and to actually start trying it. To discover God as a person, as someone who can be known personally and that I can grow a relationship with him by spending time talking to him and listening to him. This idea came incrementally over the past week as I’ve been listening to talks by Wayne Grudem from his Systematic Theology. On prayer, Dr. Grudem tells a story about a pastor who felt called to pray four hours each morning from 8am to 12pm. As his church grew he cut back the hours little by little until he was only making time for a few minutes at the start of each day. Not too long after, he received a call from an old acquaintance across the country who told him, “I don’t know why I’m saying this, but I feel the Lord has given me a word for you.” “What is it?” asked the pastor. “God says, ‘I miss our time together.’” The pastor broke down in tears. God desires us to spend time with him because that’s why he created us. We are created to worship and glorify him and to find joy in his presence and provision. God desires that time and we draw the greatest satisfaction from connecting and communing with him. In praying more, getting over the amount of time I think I might be wasting has been a struggle. But I think that it’s a holdover from the way I used to pray. I used to try and get through my list of things to say, and felt like this was just another chore to accomplish or another tick to mark in a box. No wonder it was difficult to take the time. Martin Luther is regarded as saying, “I have so much to do today that I’ll have to spend the first three hours in prayer.” Prayer is not another thing to check off the list as you go about your busy day; it’s the very thing that will allow you to do anything. Not because it’s a magical formula, but because building a relationship with our creator is the single most important thing in all of life. Everything else will grow from this relationship, finding its proper place as we “live and move and have our being” in him.